Last year we saw how a kickass burger is made right at WFM! If you haven’t seen it already (but seriously, how couldn’t you? ), FC Beat Magazine is a bright, fun, modern, and attractive magazine that highlights the “Food, Arts, Culture + Color of Fairfield County.” Paper copies are everywhere and we snag them when we see them, but they also release digital versions so it’s easy to keep up with each issue. In the current Winter 2015 issue, some of our favorite Fairfield County chefs take over the pages in a delicious spread called “Love & Braises.” It’s fun, it’s playful, and it’s a good read when you see what these chefs are up to and how they interact. Featured are Chef Pat Pascarella of Bar Sugo who cooks up a killer Oxtail Crostino (recipe here), Chef Shelby Gopinath of The Fez takes us through his quintessential Moroccan-style Braised Lamb Shank, Chef Jared Falco of Washington Prime gives us a little Weezer inspired dish a la Pork and Beans, and Chef Franco Camacho of Geronimo digs down deep into his Bison Osso Bucco. And, as an added bonus, FC Beat writer Mike Mackey takes you through a braise of his own: braised rabbit. If you’re still not sure about what to make this Thanksgiving, then we’ve got some great recipes for you to follow. A collection of Thankgiving dishes that will make this holiday the best one ever in recorded history. All of these recipes come from chefs and local business owners who have appeared at Westport Farmers Market and support it. Food competition shows are fun to watch on TV, no doubt. There’s lots of excitement, panic, stressful situations, and lots of smack talk going down. But, you miss out on a key component: interaction. You can’t talk with the chefs, (even though you might be yelling at the TV and telling them to not cook the pork for any longer, they can’t actually hear you) and you certainly can’t taste all the awesome food that they are making. Well, you’ve got your chance as the Connecticut Chefs Challenge returns for another year at Lincoln Culinary Institute in Shelton. 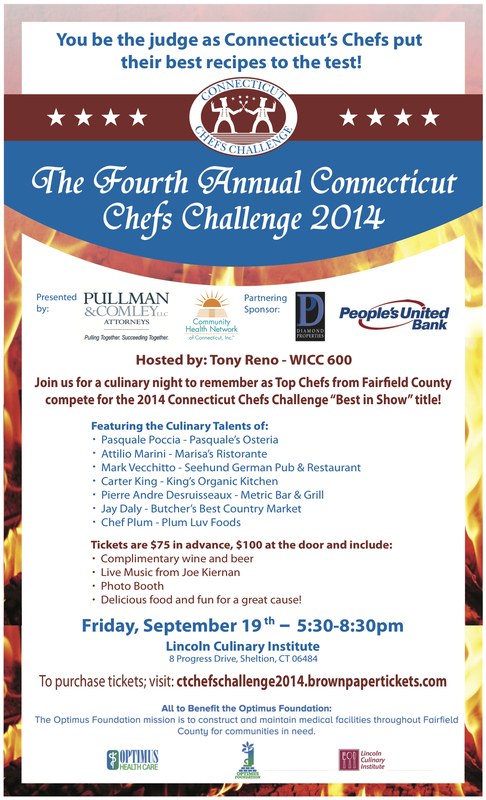 This year there are seven CT chefs who are vying to win the title of “Best in Show.” The fun begins at 5:30 with a cocktail reception where you’ll learn about The Optimus Foundation (they construct and maintain medical facilities in Fairfield County for communities in need) who this event benefits and you’ll get to down some great small bites to help prep you for the contest.